how to Point at my google Domain correctly? Can I please have the URL of your site? 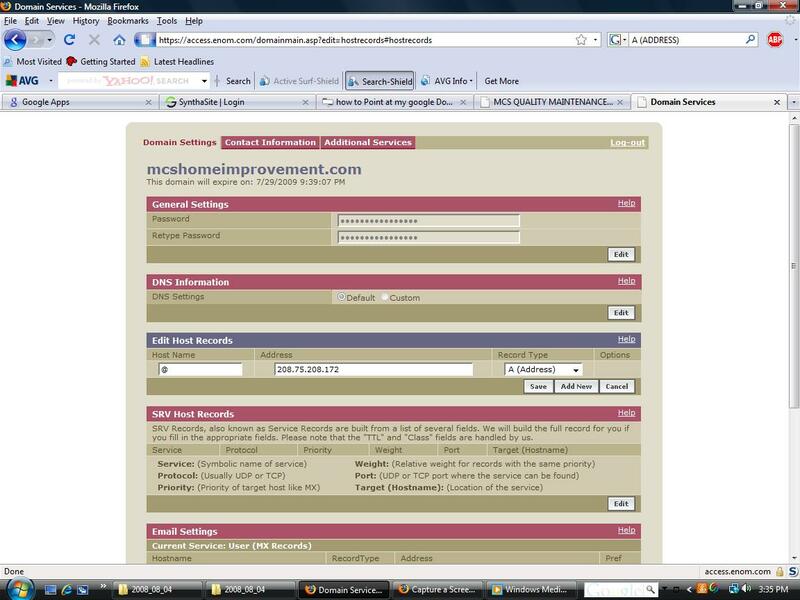 http://mcshomeimprovement.com seems to be pointing to the correct IP address "208.75.208.172"
However http://www.mcshomeimprovement.com is pointing to "72.14.207.121"
When setting up your site to redirect to your iGoogle page you possibly set up a CNAME record that points www.mcshomeimprovement.com to ghs.google.com as google suggests. You would need to now remove this google CNAME entry. Please note it can take up to 48 hours (although usually less) for your DNS changes to propagate. has anybody out there used a Google domain and got it to work? Can you try re-adding the A-record since the ghs.google.com CNAME you had previously might have affected it from working correctly. do i add www.mcshomeimprovement.com as the host name and mcshomeimprovement as the address? never mind i got to work. Hey JD - Well Done and you are welcome!